Laboratory risks in the workplace are not just found in working with hazardous materials, but also when employees are exposed to ergonomic harm. 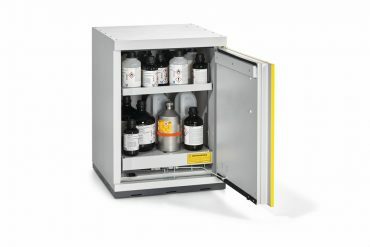 OSHA (Occupational Health and Safety Administration) advocates that employers avoid ergonomic-related risk factors amongst their laboratory staff by storing hazardous materials in approved cabinets with easy retrieval. Repetitive motion injuries occur when muscles and joints are stressed, nerves are pinched and tendons become inflamed. 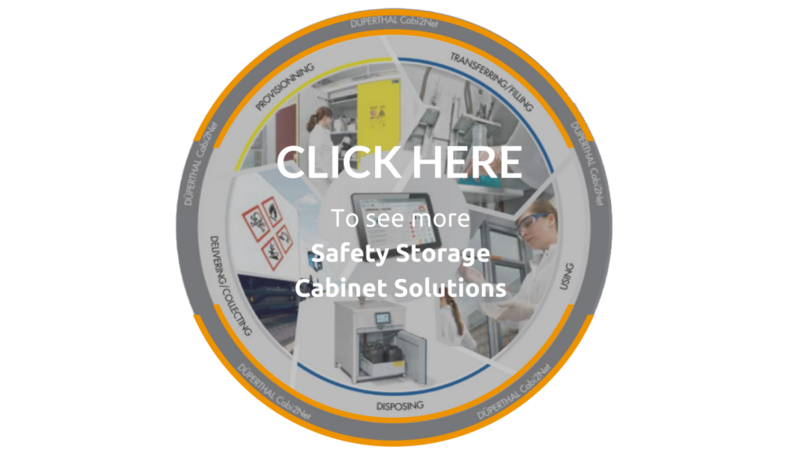 Eliminate the pressure on your back and knees and the potential for hazardous spills caused by attempts to locate the required containers within your cabinet. Minimize strain caused by your daily, repetitive operations by investing in safety cabinets with pull-out shelves that increase your productivity because of the heightened level of comfort. If you’re in a state that mandates self-closing doors (see NFPA 1 (Uniform Fire Code) or IFC (International Fire Code)) on your safety cabinets, then it’s important to be in compliance. 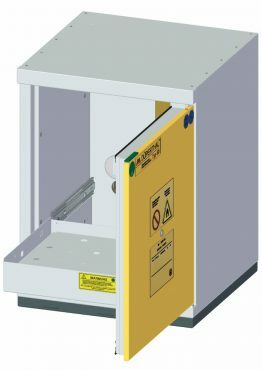 In the event of a fire, the pull out drawers on DÜPERTHAL safety storage cabinets will automatically retract and the wing doors will close, along with the ventilation openings for air supply and exhaust. The door gaps and joints will seal by foam-forming gaskets. For daily operations, self-closing doors eliminate the potential for casualty caused by lab staff’s accidental failure to close the cabinet door. Download your copy of this information here.